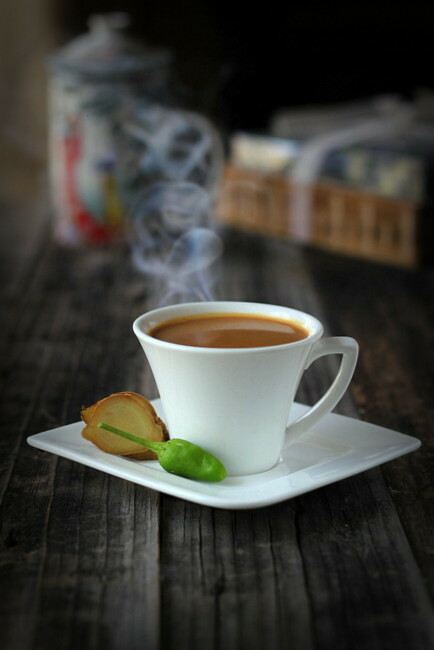 How about Chilli in a steaming cup of masala chai ? blog by the name Jugalbandi. I wonder how many of the fresh new bloggers know about this awesome space by the lovely Jai and Bee! They were one among my blogger buddies who never failed to place from- the- heart sort of comments in each posts those days. I adored them for the classic and unique way they put up their creations as posts, in return, their photography, write up and the information shared were always a cut above the blogs I knew then. Jugalbandi was born a month before Spicy Chilly, the reason we celebrated the fifth birthday very recently. “There’s chilly in my chai” had been one of their simple yet unique posts I had wanted to try and recreate in my space for some time, in fact, a drink which my grey matter had bookmarked for the past five years! 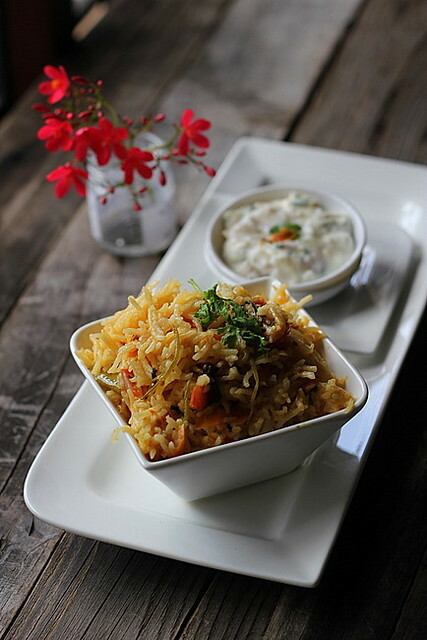 The heat of the chilly and the spicy blend of the masalas! Wow! this is my cup of tea! 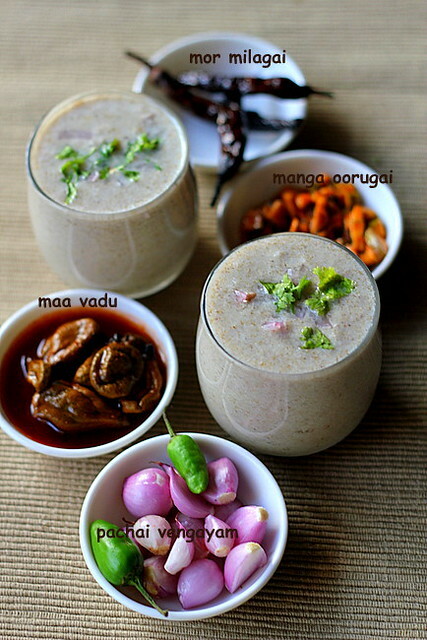 Akkaravadisal ~ Food of the Gods! Tamil Nadu! The land of ancient culture and temple amuses anyone with the variety of divine sweets, being offered to God on auspicious occasions. 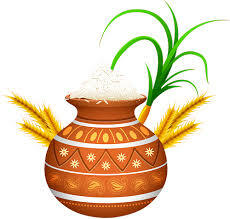 Akkaravadisal is a preparation made almost like pal pongal or sakkarai pongal or to be precise it falls right in between the two, belonging to the Pongal family! Akkaravadisal is offered to God ( Maha Vishnu?) 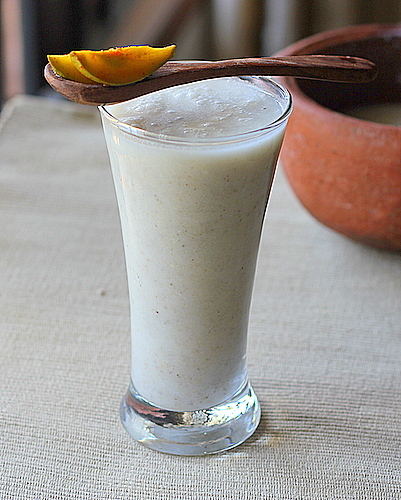 for Koodaravalli. 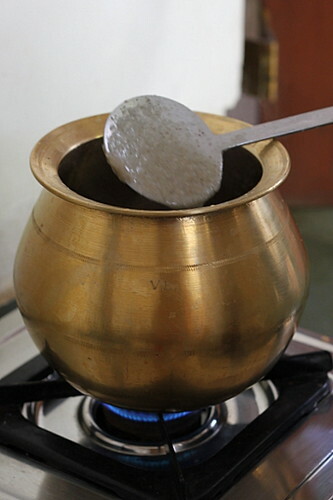 This is a tried and tested recipe of the sweet, primarily cooked in a pressure cooker and then in a non stick kadai, a practical substitution to the traditional bronze pot method. 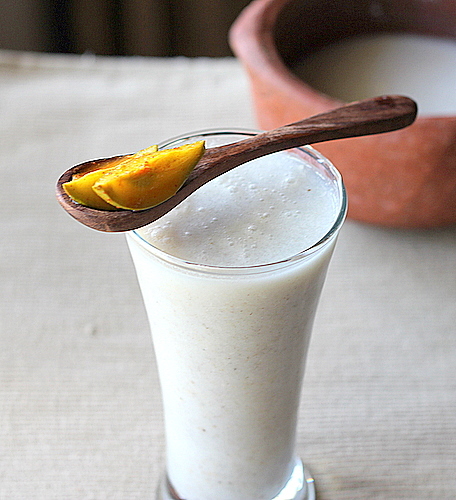 Kambu Koozh / Pearl Millet or Bajra Porridge - The natural body cooler - stepwise tutorial and five years of blogging! 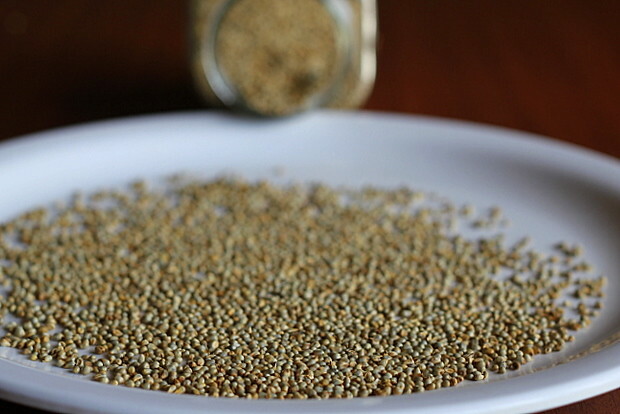 While we had to squeeze our brains planning a meal out to satisfy all the members in our joint family on a daily basis, this millet meal received unanimous support as it was undoubtedly favourited by all! 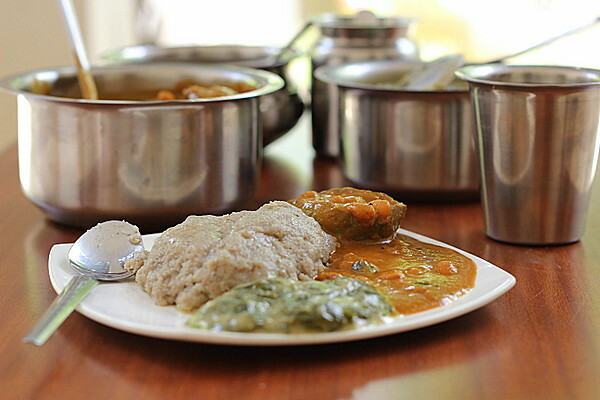 Honestly, I never had a hand in preparing these meals then, ma-in law and ammayi supervised the maids to get it done in bulk. 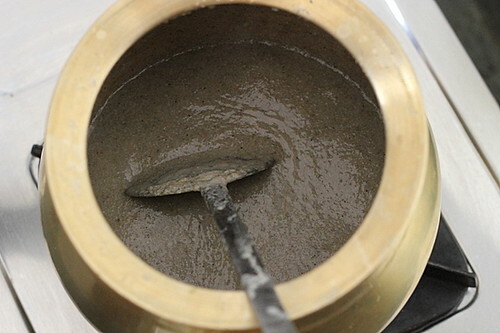 I concentrated in making the kuzhambu and koottu ( I will do a separate post soon) which went with the meal. This hot meal served with sesame seed oil or nallennai on fresh green plaintain leaves with the koottu and kuzhambu is considered heaven! 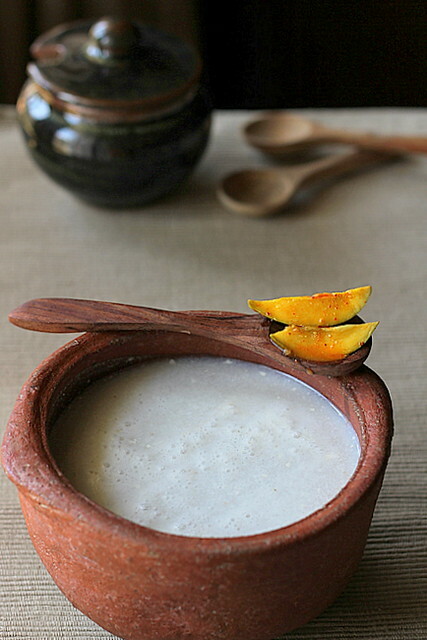 According to the folks of the state and the elders in the family, 'Kambu saadham' is regarded as a food which generates heat in the human body and the reserves of the cold meal diluted with buttermilk believed to neutralise the heat and in turn serves as the best body coolers in summer! 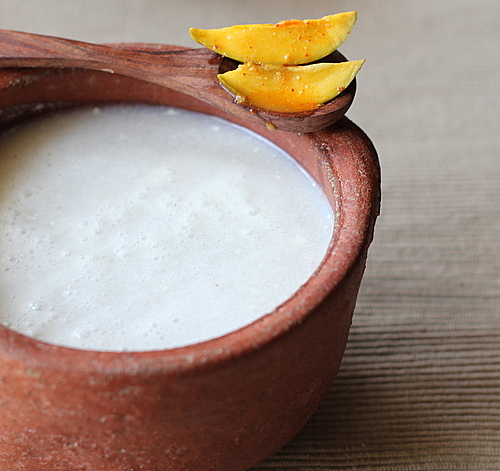 This, infact is the Kambu Koozh which is again a healthy option and quite common summer street-side drink stored in earthern pots here! 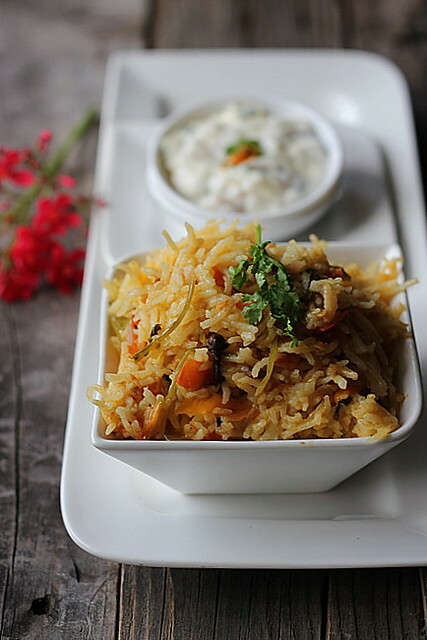 Well, through this post I had tried my best to recreate the same traditional way I had witnessed years back, in a lesser quantity, which I personally make at home regularly. 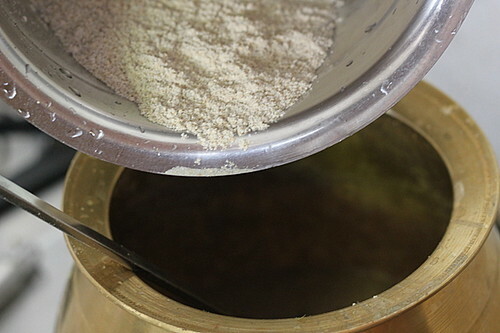 The woody flavour of the Kambu compliments with the bronze utensil in which it is prepared and I had stuck on the same authentic way, though elaborate! The step by step method, I hope, will guide through even a beginner! 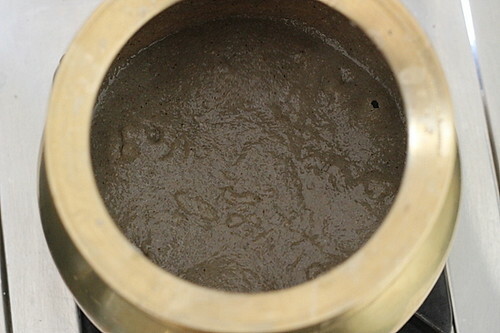 Wash 1 large cup of Kambu well in running water and drain on a kitchen towel. 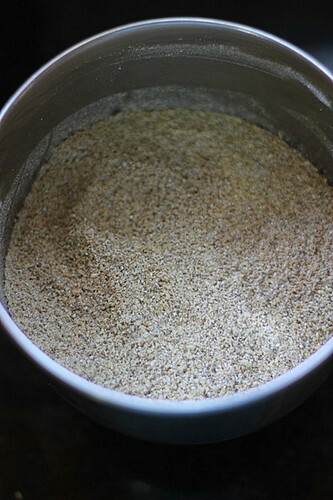 Pulse in a mixie while the grains are not completely dry but a little moist. 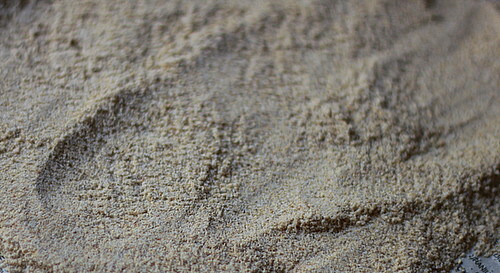 Like rice grains,this way it's easier to powder! I have broken the grains in quick shots / pulse mode. Repeat once or twice..
..till you get 'an overall coarse' powder. Do not disturb the powder sticking to the mixie lid, if you have any. 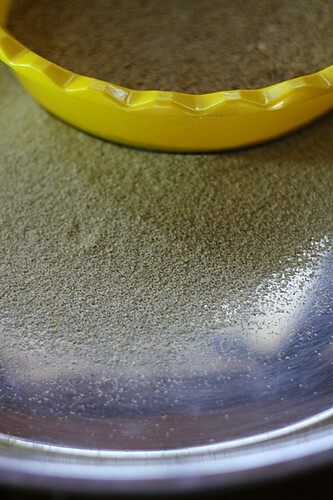 Even if you dont see the finest powder sticking to the inside of the lid, don't bother. The prime lens let me down a bit here by focussing only on the finest powder :)(sticking to the insides of the mixie lid, said earlier). Hope you can make out the difference between the three! After 15-20 minutes in medium flame. 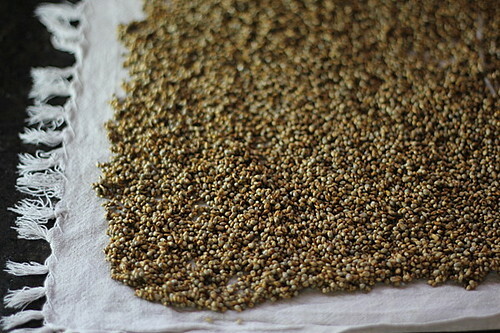 Notice the cooked grains.You can feel it and ascertain between your finger tips. Stir along the finer power now. 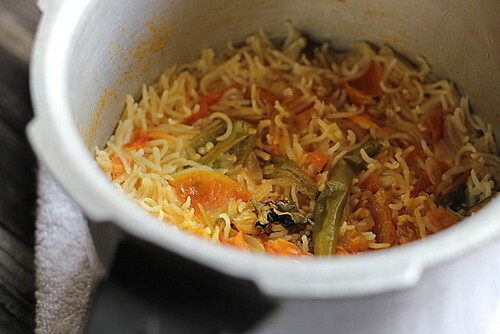 You can alternatively close the pot with a lid and keep the flame to minimum and let it cook. 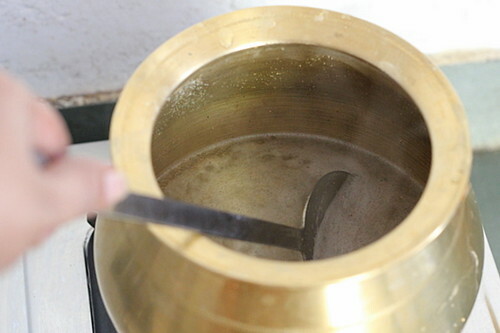 But see to it you use a bronze or heavy pot as I have used here as it tends to stick to the bottom if left unattended. Always have an eye on the pot and stir once every couple of minutes. This wont take long. Between 5-10 minutes and is cooked. 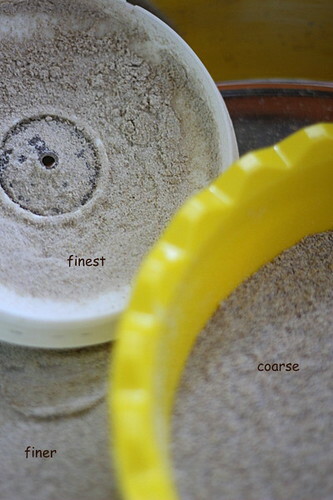 The finest powder should go last. 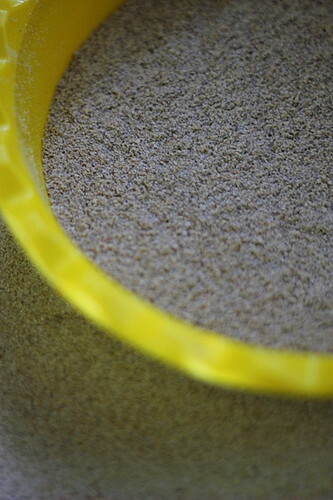 Keep stirring as you add along with 3/4 tsp of salt. 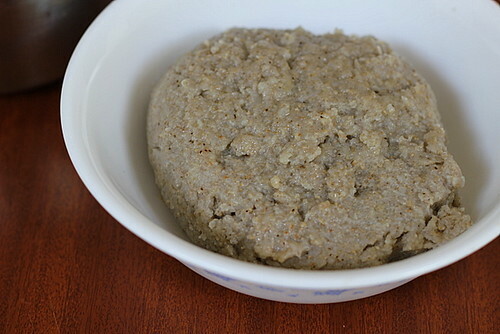 The porridge gets thicker in about 5-8 minutes. 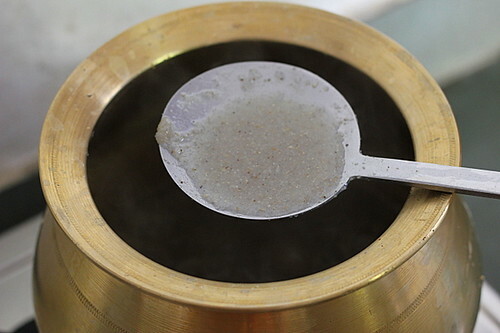 Let it remain in the pot for 15 minutes till the piping heat subsides and the gruel gets thicker. 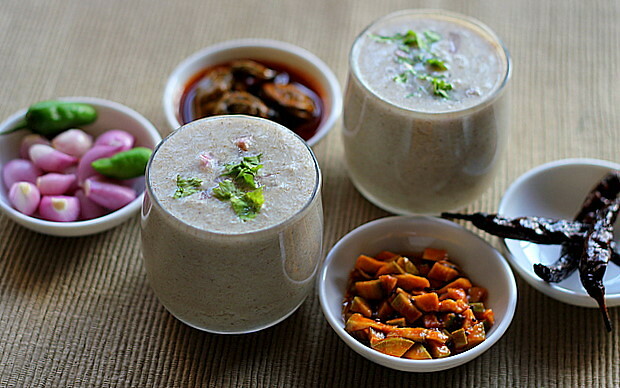 to a serving consistancy of Kambu Saadham or the healthy millet meal! 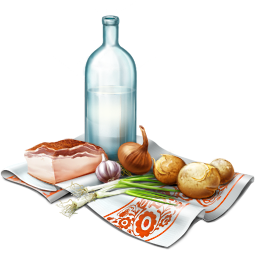 The meal thus made is rolled into large balls and immersed in cold water. This method would have been effective in those days when they had no luxuries like refrigerators and the meal kept well for one or two days. In fact these balls are the ones used to make the Kambu Koozh. 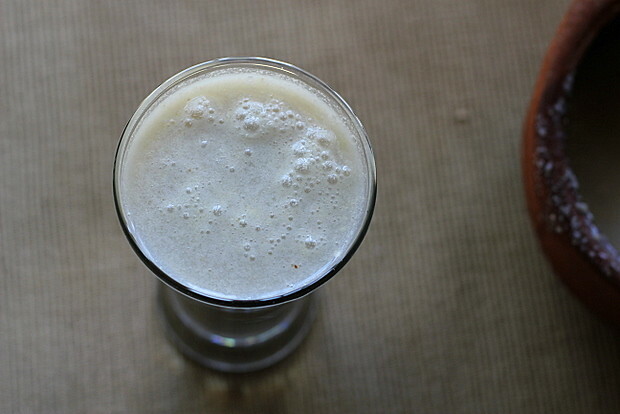 whip the above ingredients in your blender and serve cold in a tall glass. This would serve two tall glasses. 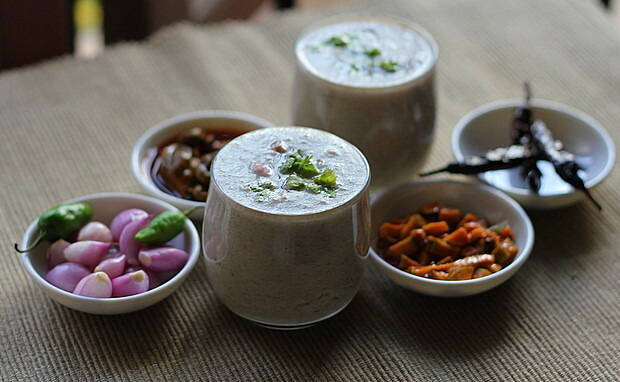 The Cold Kambu Koozh topped with finely sliced onions and corainder leaves serves as the best body cooler on a summer noon! 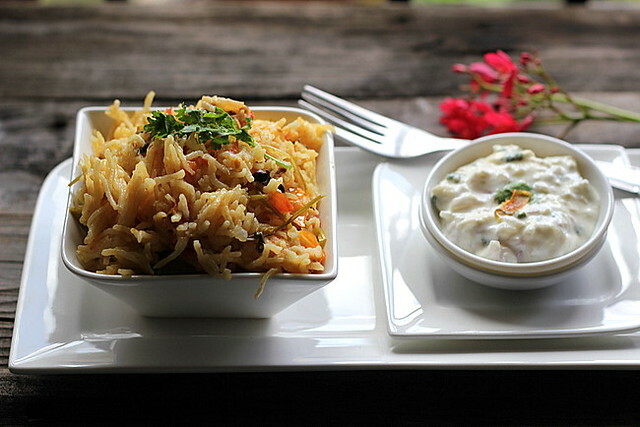 Marking the fifth year of blogging I had wanted to make an exotic recipe post but rather ended up with an authentic post of the state. The past few days had been hectic with lots of travel and a bit of commitments which kept me occupied. 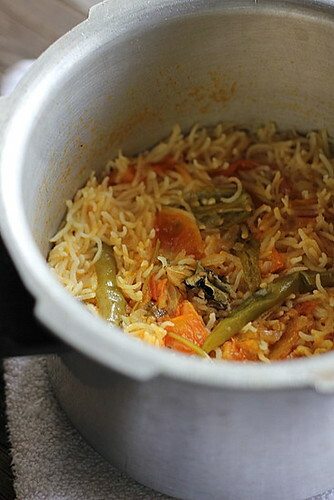 Anyway I am happy that I could make this traditional Tamil recipe post, a step by step tutorial which anyone who loves the same can give a shot. These kind of posts gives me more satisfaction as a blogger! 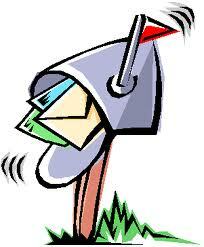 My dear readers and followers for the staunch support you had been rendering for the past five years of my blogging! 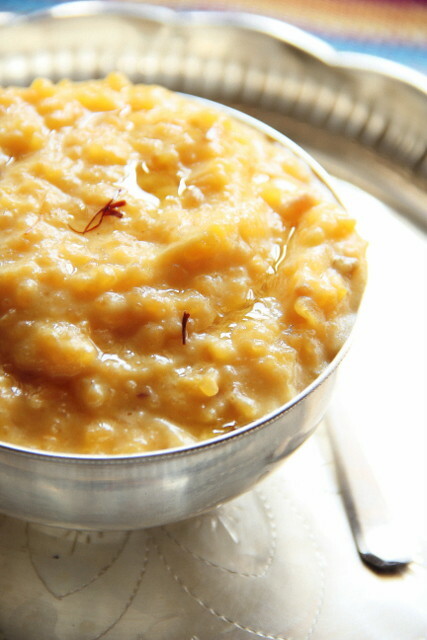 Heat oil + ghee in your pressure cooker ( mine is prestige 3 ltr) body and throw in the 3 spices. Saute the onions till translucent followed by the green chillies, ginger-garlic paste and tomatoes in order. 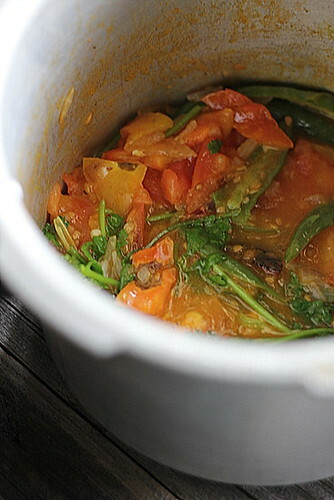 Let the tomatoes turn a bit mushy (this will take 2-3 minutes)Stir in the herbs. Pour the measured water and bring to a boil. Add rice and stir in salt. Cook until 3 whistles. Let the steam vent off by itself. 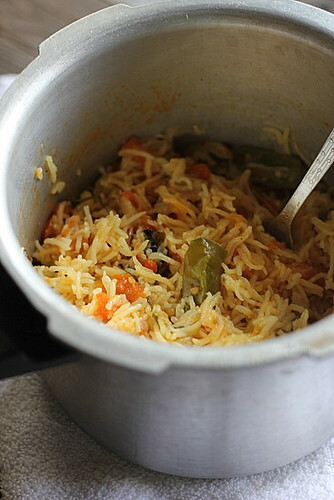 Open the cooker and fluff the rice gently with a fork. Transfer to a serving dish and serve hot with onion raitha. 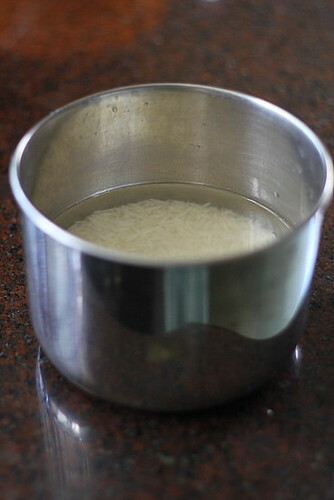 Wash and soak rice in water for 30 minutes. Get ready with the other ingredients in the meanwhile. 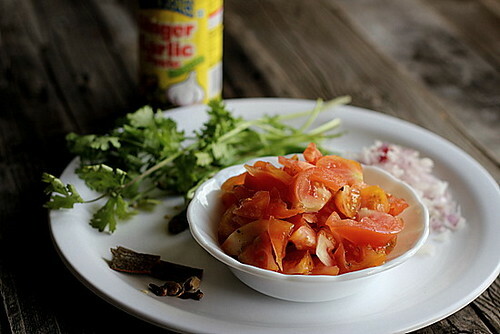 Tomatoes and onions sliced, spices, herbs and the ginger garlic paste. 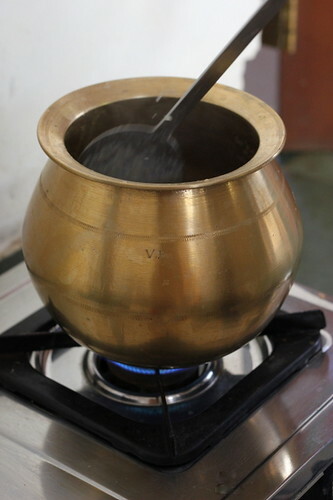 Heat *oil + ghee (I always use a mixture but you can use one of these too) in your pressure cooker ( mine is prestige 3 ltr) body and throw in the 3 spices. 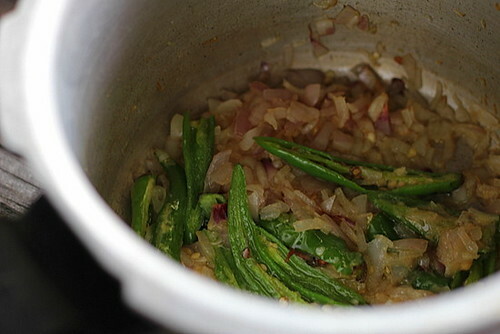 Saute the onions till translucent followed by the green chillies, ginger-garlic paste and tomatoes in that order. 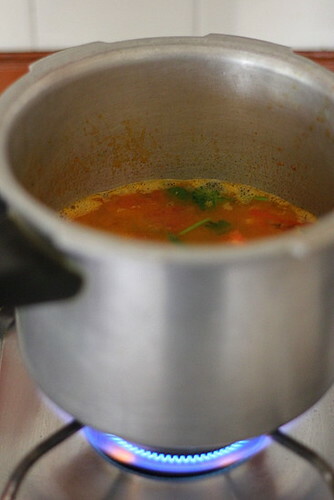 Let the tomatoes turn a bit mushy and let out the juice (this will take 2-3 minutes). Pour the measured water and bring to a boil. 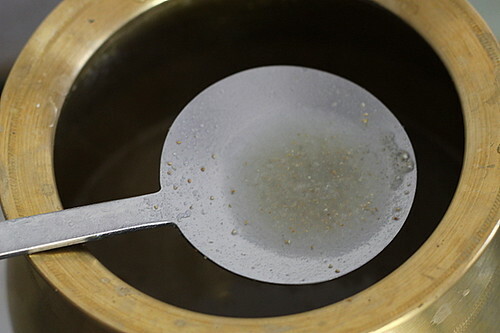 Add rice and stir in salt. Cook until 3 whistles. Let the steam vent off by itself. Open the cooker. 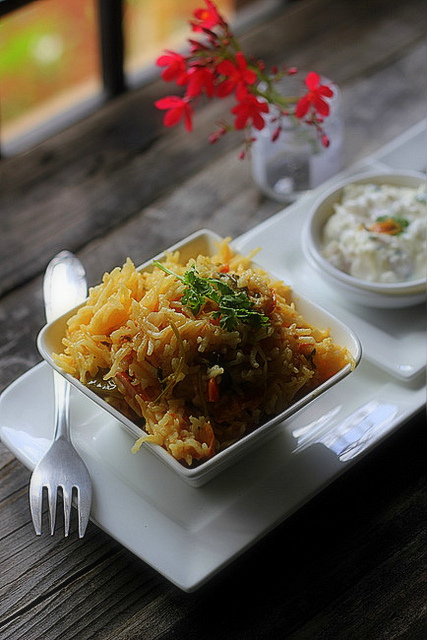 Fluff the rice gently with a fork. Transfer to a serving dish and serve hot with onion raitha. 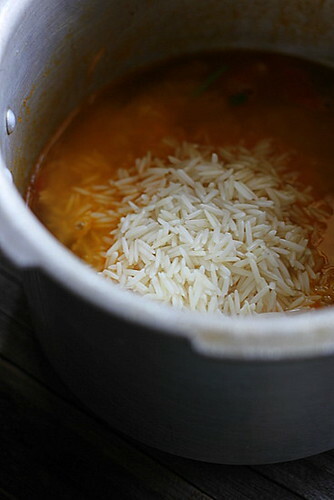 Again, I have used age old basmati which works perfect. If you use any other variety of rice, minimize the amount of water and adjust it to 1 1/4 to 1 1/2 cups since it may get overcooked. All text and photographs are subject to Copyright © 2007-2017. All rights reserved.